And I thought you couldn’t get Krispy Kreme donuts in Vancouver any more. Well, you can – or at least you could Sunday evening in front of Superstore at Grandview and Rupert. 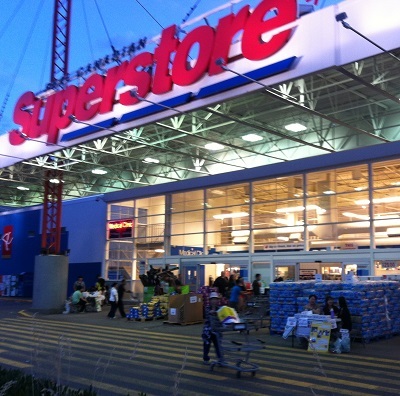 Pastor Jonathan Jeong and several other members of Korean Baptist Church of Vancouver were front and centre at the entrance to Superstore, seated comfortably behind two tables covered with boxes of Krispy Kreme donuts. 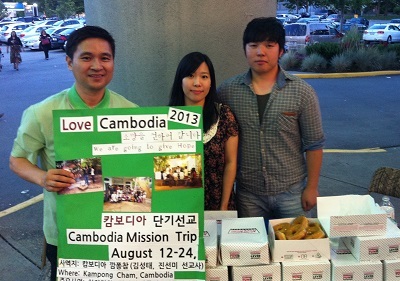 Pastor Jonathan Jeong, with two members of the Korean Baptist missions team to Cambodia. Jeong said the money will be used to buy instruments for worship leaders in the local church, and to teach them to lead their own worship music. The praise band will invite non-Christians to hear them play while they’re in Cambodia. The missions team will be made up of about 10 people from Korean Baptist Church (which meets at 4798 Gladstone Street, near Nanaimo and Kingsway) and from Korea. Korean Baptist Church is part of CNBC (Canadian National Baptist Convention), which has a vision of 1,000 healthy, reproducing CNBC-affiliated churches by 2020 (there are something over 300 right now). Korean Baptist Church has a website, but you’ll need Korean to appreciate it.